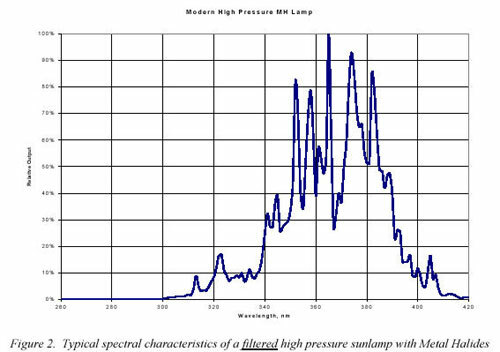 What are the differences between low pressure and high pressure sunlamps? Low pressure sunlamps are most prevalent in our industry by a large margin. These are usually the 5 or 6 foot linear tubes, fluorescent technology. The term ‘low pressure’ evolved as a result of the pressure contained within the glass tube. This pressure amounts to somewhat less than one atmosphere, actually a slight vacuum. When the lamps are broken, they actually collapse, or implode, as the external positive atmosphere rushes to fill the space within the lamp at negative atmosphere. When low pressure (LP) lamps receive the proper voltage and current from the ballast, an arc is struck from one end of the lamp to the other. A small amount of mercury is vaporized by this arc, causing ultraviolet emissions. A thin coating of phosphor (or a blend of phosphors) on the inside of the bulb wall is excited by the mercury’s UV emissions. The phosphor selection determines the output of the sunlamp; the phosphor converts mercury output (similar to early High Pressure, figure 2) to the tanning spectrum output common to LP sunlamps (figure 1). Most of the emissions are not visible; this is the UV needed to stimulate the tanning process. A small amount of the emissions are visible. Only a small portion of the visible light leads to pigment darkening, but it is a handy way to tell that your lamp is working. Output from LP sunlamps is a combination of UVB (280-320nm) and UVA (320-400nm), plus the small visible component described earlier. Differing effectiveness from one lamp type to another is modified through adjustment of the phosphors. Despite the ‘conventional wisdom’ that increasing UVB makes for a hotter lamp, this is not always the case. In fact, using such simple rules of thumb can lead one down an entirely different path than wanted. High pressure (HP) sunlamps are commonly seen as added ‘facials’ at the head end of sunbed canopies. They are also popular in numerous sunbed styles and, more recently, in booths. These lamps are inches in length, versus feet for LP. The tube is most often a quartz blend vs glass for LP. As the name implies, the pressure within the tube is more than one atmosphere, and the heavier quartz tube is needed to withstand the thermal and emissive energy while containing the pressurized environment. The compactness of the HP lamp makes it easier for equipment manufacturers to design effective delivery optics. HP is also an arc discharge source. An arc struck across the lamp’s length vaporizes a small amount of mercury resulting in UV emissions. Output from early HP product was essentially derived from the arc discharge itself. 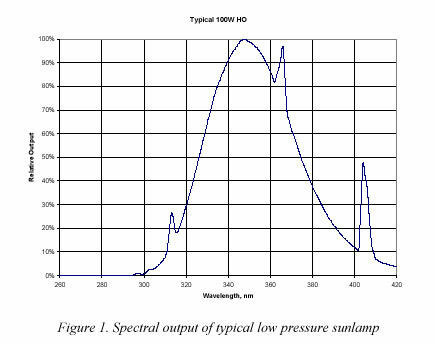 Figure 1 shows the spectral output of these lamps. Almost all of the output was UVA, which is effective for pigment darkening but has little effect at generating new pigment. Some UVB is present, and a small amount of UVC. Undesirable UVC is blocked by the filter(s) between the lamp and the tanner, and these filters must be kept in place and in good repair. Conventional UV phosphors such as those used in LP sunlamps are not suitable for the rugged environment of an HP lamp. In order to change the output character, to modify HP output as is done in LP, materials must be added to the arc stream. Metal halides (metallic salts) have been added to some HP lamp types to accomplish this objective. Like the mercury, these halides are incorporated into the arc stream, with resulting changes in UV emissions. 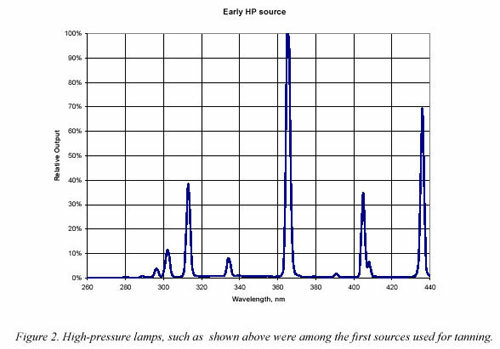 Figure 3 shows the spectral output of a typical HP lamp employing metal halides. Filtering undesirable wavelengths emitted by the lamp.